Liczba stron: 133 Jest to ujednolicona liczba stron, która ułatwi Ci porównanie długości książek. Każda strona Legimi to 200 słów. Astrology Uncovered: A Complete Guide to Horoscope and Zodiac Signs Discover how astrology works. This book is written by an expert on astrology. This book will teach you the meaning and significance of the planets in astrology, how to read the astrological chart and a detailed breakdown of each birth sign, horoscope and zodiac sign. After reading this book you will have a full understanding of what astrology is, how it works, how to read star signs and most importantly how to read your birth sign and that of your friends and family. Learn from a master on the subject. 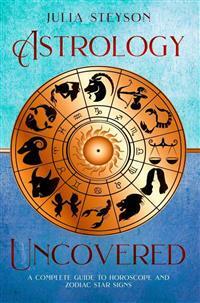 Thanks for purchasing Julia Steylon’s comprehensive guide on Astrology Uncovered Book. We recommend you also get her book on Wicca, Magic, Spells and Witchcraft.. It is called: Wicca Spell Book: The Ultimate Wiccan Book on Magic and Witches: A Guide to Witchcraft, Wicca and Magic in the New Age with a Divinity Code. And we also recommend you check out Julia Steyson’s book on Tarot Cards. It will leave you spellbound! Twenty degrees up and down from the ecliptic and celestial equator, 12-star groups can be found and the name "Zodiac" was given to them in the dawn of times. This name allegedly comes from the Greek term “zodion”, which means the “animal belt”, and almost all of the names in it refer to animals. A common belief is that the names of the star constellations and their groupings came from the first hunters and nomads because they needed a proven method for orientation. When the age of agriculture arrived, determining the seasons of the year became necessary, and the motion of the Sun and Moon through heavenly constellations became determining factors for the meteorological and even political successes or failures. Archeology has found firm evidence that the early humans from prehistoric times had an understanding of celestial movements and events. Many discoveries show that people of those ages carefully watched the sky and that they had precise calendars. Those calendars mainly portrayed the motion of the Moon, the Sun, and oddly, Venus and the star system of Pleiades. Why prehistoric men would have such an interest in aligning with the Pleiades or even Venus, no one knows, but this also raises another question. Why would prehistoric people even want to follow and measure the motion of celestial bodies to the extent that they were building huge systems of stones, and later on temples, to be able to track the Sun or other significant heavenly objects? Was it just for orientation, which is useful for hunting? Certainly not. Astrology, together with astronomy because they were considered as one science, originated in Babylonia and Sumer. Both are considered one of the oldest natural science in the world. How come that the cradle of civilization had such knowledgeable astronomers/astrologers? If we forget about the official history for a moment and start speculating, could aliens, known as Annunakis, have taught them this art? Scriptures mention that “angels” taught humankind the art of metallurgy, medical treatments and remedies. They even advised women how to start applying makeup and of course, they showed us how to “read the sky”. The whole area of Mesopotamia, including Babylonia, Sumer, and Assyria, is rich in archeological artifacts related to astronomical/astrological themes and many of them are dated older than 2000 BC. Babylonian priests were known for their superior knowledge about planets, stars, eclipses, and all geometrical aspects those bodies can form, which was used mainly for political predictions. Bear in mind that in those ages, there were no daily horoscopes published for the common people. Natal horoscopes were drawn just for the members of the royal families and astrology was also very useful for selecting the proper dates for building new cities or attacking enemies. This remained the norm almost until the last century because the natal charts of the "common people" were seen as absolutely unimportant. Enuma Anu Enlil is the most famous archaeological artifact from these times. It is the compilation of 70 cuneiform tablets, which describe 7000 astronomical/astrological omens. During the following thousands of years, the science of mathematics was also developed, which was used for very precise calculations of the celestial positions and the creation of the first ephemerides. From Babylonian times, humankind inherited the habit of naming the planets after the gods and to associate them with mythical stories. To this day, many modern astrologers claim that the original and most precise astrology called “Eden Astrology” can still be found in the areas of Iraq and Iran, but it is extremely hard to find astrologers who are practicing this art and who are willing to teach it, because astrology is outlawed in those two countries. Myth or truth, it’s still hard to discover the answer. Astrology was brought to Egypt around the 5th century BC by the Persians. However, Egypt was an extremely developed country in those times and it’s hard to believe that they didn’t know about planets and stars until the Persians came to conquer them. Whatever the case may be, Alexander the Great founded Alexandria and by the second century BC, this town became the location of the most famous university in the world. Ptolemy wrote an extensive work, Tetrabiblos, about the planetary characteristics, exaltations, triplicities, and many other basic facts. In those moments astrology, as we know it today, was born. Horoscope charts were made and analyzed in a very similar way as they are done today. While the dark ages held power over Europe, the world of Islam continued the tradition of Alexandria's Great school. Many scholars went east, running away from rising the Christian dogma against natural sciences. The city of Baghdad became the new center of knowledge and many sciences in the forms as we know them today were founded there. The Arab world researched methodically so-called "fixed" stars and their influence on the life of our planet, and classified the system of calculating mutual relations between celestial bodies, which is known today as “Arabic parts”. When we look at the east, we are amazed by the levels of knowledge Indian or Hindu astrology achieved. The first notion of this art can be found in Vedas, which claimed to be the oldest known texts. By the times of Alexandria’s greatest breakthroughs, Vedic astrologers had to deal with higher mathematics and very serious and precise astronomical observations. The legend goes that the ancient sage Bhrigu, one of the Saptarishis (seven sages who helped to create the universe), has all the horoscope charts of all people who were born and will be born on this planet. Due to its close relation with astronomy Vedic or Hindu astrology deals with sidereal positions of planets and uses somewhat different types of aspects, while the meaning of all celestial bodies, zodiac signs and houses are the same as they are in the “western” school of astrology. Chinese tradition is known for its concepts of yin and yang, and it uses somewhat different types of calculations, but astrology is present there from the ancient times and besides the popular Feng Shui, which deals with the energies of the Earth, Ba Zi art deals with heavens. Over the Atlantic Ocean, Olmec and the Aztecs were known for their calendars and precise mathematical calculations when it comes to the position of our planets, especially Venus and, as you can guess, a constellation of Pleiades. However, later on, the Mayan calendar became the most recognized and famous calendar in the world. Back in Europe, it didn't take a long time for astrology together with astronomy to rise again. Until seventeenth century, science was necessary if you wanted to become a doctor, for instance. All diagnostics and healing treatments were done according to the planets and stars. A Christian church wasn't so satisfied with this fact, but it was powerless due to the popularity and the cautious approach of astrologers in those ages. However, when the era of humanism and education came, astrology was pronounced the occult science, or better yet, something which is not science at all. From that moment in time, it was separated from astronomy. An interesting fact is that Isaac Newton, the father of modern scientific thought, was the one to passionately love and study astrology. A few hundred years have passed and astrology is back again. With the rise of modern psychology, astrology took a somewhat different turn, interpreting the planetary aspects through the inner or emotional states of human beings. Luckily, after decades of vague readings, astrology returned to its roots again, and as such, interprets the outer events and envisions the future. Mistakes happen, indeed, but if the astrologer during the reading can see around 75-80% accurately your past, present and future events, challenges, losses, and triumphs, then you have found a quality consultant and you can count on that person to be your greatest ally for the planning of your future. Let’s just not forget the words of JP Morgan: “Millionaires don't need astrologers, but billionaires do”. With this in mind and if you are interested in learning something more about yourself, you will find this book extremely useful, because it will help you to see clearly what are the meanings of the planets, signs, and houses in the horoscope chart and how to recognize your character, future challenges and even how to use those challenges for your success. This can be applied to all people and the most important part is that you will be able to predict the outcome of your relationships with others. You will also learn something about myths related to ancient gods and perhaps even have a little fun. Through the eyes of astrology, our lives are determined by celestial bodies; such as, fixed stars, meteor showers, various flying objects and so on, but to be able to read astrological charts, you have to learn the basic traits of the main heavenly “influencers” and these are: Sun, Moon, Mercury, Venus, Mars, Jupiter, Saturn, Uranus, Neptune and Pluto, as well as the North and South Nodes of the Moon - Rahu and Ketu. The ultimate deity in our little piece of this cosmos is the Sun. The Sun is the father of everything, the central body around which all others revolve. Its shine is the essence, the light, the life in us, and the energy source for photosynthesis, which is the basic metabolic process for plants and even for animals. We are all eukaryotes after all. Without the Sun, we are not able to exist. This is also the first god in any early religion and the founder of the yearly calendar because we have the spring and autumnal equinoxes, and the summer and winter solstices. Around those four points in time, all of our rituals were created and worshiped throughout the existence of humankind. Nothing else is so powerful and nothing else can create or destroy us like the Sun. Its qualities are: center, masculine, warm and dry, royalty, generosity, responsibility, light, warmth, vitality, power, honor, glory, reputation, authority, healthy ego, stability, maturity, calm enthusiasm, goodness. If it’s placed in an unfavorable position and in tense aspects with other planets, or points on the chart, it can result in: vanity, arrogance, narcissism, snobbism and so on. The Sun, forming a beneficial aspect with the other planets, will always give the characteristics of someone who doesn’t know about mean behavior, a person with classy manners, with good judgment, and a natural born leader. Its negative planetary aspects will portray a person who is pretentious, egoist, or untrustworthy; someone who ruins order or life itself. The Sun is the king, a middle-aged man, rich, or in other terms, a very successful man. This star also represents the day of Sunday, the lion, cats in general, bees, royal and golden colors, castles, decorations, gold, glitter, expensive jewelry, blond hair in females, a man who loses his hair when it comes to males, France and all royal families. It is the vision and therefore symbolized with eyes. In male charts, it is mainly the right eye, in female charts – the left one. In the terms of medical astrology, the Sun is the heart, the spine and the bone marrow, vitamin D, and many claim that it is also vitamin A; all crucially important parts of body. In the terms of music, according to Pythagorean ideas, this is the sound “do”. The conjunction of the Sun and Moon, and their placement close to the North or the South Nodes of the Moon and some fixed stars like the Pleiades, Hyades or Praesepe can show blindness. Positive aspects with the Moon bring unity between the will and emotions, and good relationships between parents. Negative aspects show the internal war between the masculine and feminine, between the father and mother in us, and metabolic turmoil. If Mercury, or any other planet, is placed too close with the Sun, then it is considered as burnt, so in this case, reasoning is damaged by ego. In the other case, when Mercury is positioned a bit further, this describes a person with great intelligence and someone prone to leadership. Venus with the Sun in positive aspects will show an admirer of beauty and good manners. However, the opposite will indicate problems between emotions and pleasure on one, and ego pretensions on the other side. Mars and the Sun together in positive combinations will show courage and power, but in the negative terms, this is someone prone to conflicts and agitation.